Yeah, I just coined that phrase. Do you think I could get royalties? Let the millions start rollin’ on in! I will most likely never ever ever ever ever wear contacts. Fortunately, I have superhuman vision, so that’s not an issue. But never being able to use contacts is just the most egregious outcome of my eye shyness. Using eye drops has always been probably one of the most tortuous endeavors I undertake. Yes. I said tortuous. As in, I never ever want to have to do that ever again. No, I’m not exaggerating! I NEVER exaggerate. Ok ok, yes I exaggerate. A lot. It’s an art form, really. I mean, why should I deprive the Internets of my masterful use of language to demonstrate truly amazing feats of mental extrapolation? ANYWAY. Tangent! Back to the eye shyness thing. 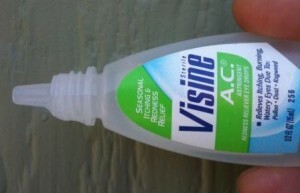 So after years and years of wishing I could soothe my tired eyes, slowly burning (if you can name that album WITHOUT WIKIPEDIA’ing IT, you rock my world) with the wonders of modern medicine in the form of Visine, and yet avoiding it until I’m desperate because of how totally awful an experience it is, I have finally hit upon a solution. And I thought, I know lots and lots of poor, eye shy folks out there who wish they could Visine up on those dusty days, those pollen-infested days, those long days of staring at computers. I should share my solution with the WORLD! So my fellow sufferers of eye shyness can finally soothe their poor, tired, red, burning eyes without fear. Yep. I’m amazing. And generous. And smart. Wait! Before you lie down, get your eye drops handy, and remove the cap. Set it next to you. Next to the eye drops. Because you want to be able to reach it without getting up, right? Ok. Now, grab the eye drops. And be careful not to squeeze it, either! Take a deep breath! It’ll be ok. Trust me, I would NOT mess around with this subject. Take another deep breath, while I explain a bit. See, that spot where the arrow is? 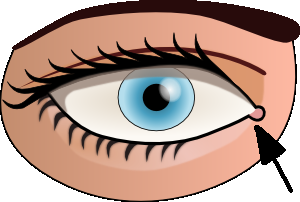 There’s a bit of a concave area formed by the eye and the nose. Have you ever been crying while lying down, and all your tears kinda pool up in that spot? That’s the effect we’re going for. Ok. Now, eye drop bottle is in position. Be careful! Still no squeezing on the bottle, or the drops will drop out before we’re ready for them. Ok. Now, here comes the tricky part. It gets easier with practice, though. Gently squeeze the bottle, until a couple drops come out. You may need to adjust your head back a bit to maximize the volume of that concaved area. You may startle a bit when the first drop hits. Keep your eyes closed, though. Now, remove the bottle, being careful not to spill any drops from your little eye pool. Now…blink. Quickly, slowly, whichever method works for you. Keep blinking. I find that doing it really fast, while looking waaaaay up, works well. As you blink, the drops will slowly spread over your whole eye. Ahhh….relief at last. Because that wasn’t so bad AT ALL. And it feels so good. TADA! Far better than trying to keep your eyes OPEN while you PUT STUFF IN IT, right? People who can do that are weird. They must have some sort of strange eye perversion. Or something. Feel free to send royalties, gushing admiration and undying loyalty. This entry was posted in blogging and tagged eye shy, i never exaggerate, useful information by Morgan. Bookmark the permalink. @Chris: Whoa! I had no idea. Thanks for the info Chris, I’ll check out something a bit more natural for my eye lubrication needs. did I ever tell you about the first time I ever had contacts put in? The optical nurse INSISTED that I learn to take them out BEFORE I learn to put them in because taking them out is harder… She insisted that she put the lens in my eye (as was apparently protocol in that office for first timers). I said NO. I told her I’M SQUEAMISH DON’T TOUCH MY EYE. She insisted. She put the lens in and I fainted. Fell right out of my chair out cold. I was unconscious and she apparently freaked the hell out. I came to and found too many people in the room… It had never happened that way before. The let me put the other lens in by myself.